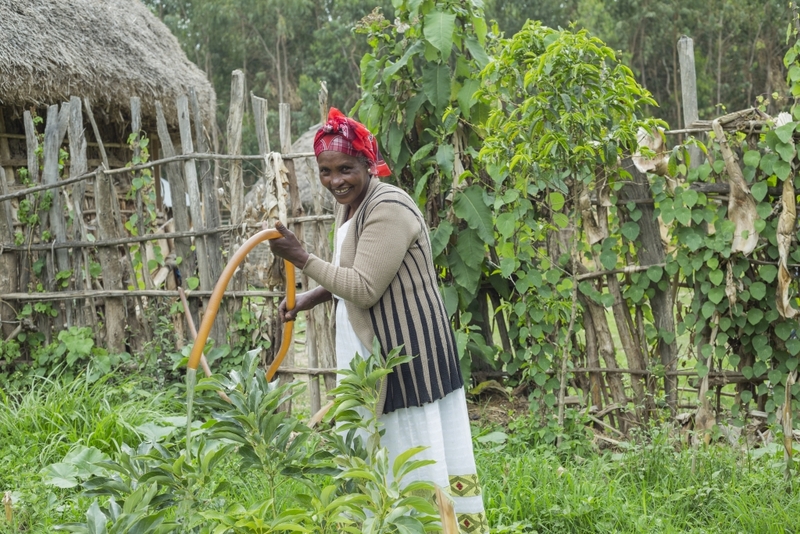 A new IWMI study conducted in Ethiopia with support from REACH, proposes a citizen science approach to community-based monitoring of groundwater that could both improve governance, while also empowering women. The study conveys an apt message for the International Day of Rural Women, underscoring their valuable contribution to sustainable development. The study also underlines the intricate connections between groundwater and multiple sustainable development goals (SDGs), including SDG 2 (zero hunger) – the focus of World Food Day on October 16 – as well as SDG 1 (no poverty), SDG 5 (gender equality), SDG 6 (clean water and sanitation), SDG 13 (climate action), and others. Citizen science in this case refers to the voluntary participation of community members along with professional scientists in collecting and analysing data on groundwater at the local level. Understanding the gender dimension of groundwater governance is critical for ensuring that the citizen science approach is effective. In addition to various domestic, production, and community duties, women hold many responsibilities related to water. These compound an already unequal distribution of labour and deepen the persistent time poverty of women around the world. Yet, often the benefit is not commensurate with the additional burden that women’s water-related roles impose on them, and frequently they do not have the power to make decisions over productive uses of water. As the new study shows, social and gender relations structure the differences between men and women in terms of their needs for and access to groundwater, their level of participation in its management, the amounts they withdraw, and their willingness to participate in monitoring and managing this vital resource. For example, in the two kebeles or municipalities where the study was conducted – Dangestha and Rarawoche – women are typically responsible for water collection. Since rural households in Ethiopia primarily obtain water from sources outside the home, women and girls spend a significant amount of time collecting water. According to a 2014 survey, 56% of rural households have to travel under an hour to obtain water; 37% travel 1-2.5 hours, and 15% travel even farther. The time it takes for women and girls to collect water is time taken away from other pursuits, such as education and economically productive activities. With more time, women could cultivate fruits and vegetables, which increase household income and strengthen household dietary diversity. Easier access to water also improves health and bolsters labour productivity. In addition, it reduces the risks that women face when travelling long distances to collect water, such as dehydration, sexual violence and attacks by dogs. Yet, women’s voices and needs are underrepresented in community water user associations (WUAs). In Farawocha kebele, 44 out of 45 irrigation WUA members are men. In both Farawocha and Dangeshta kebeles, women hold no WUA leadership positions. They most commonly cite “a lack of time, a patriarchal culture discouraging membership, little education and limited decision-making power in the household” as the main barriers to their involvement in community-based water governance. Because groundwater uses, priorities and needs are influenced by gender, men and women experience the impacts of groundwater management in different ways. Whereas women are the main water collectors, and also use it for cooking, washing, watering livestock, and gardening, men primarily use groundwater for irrigating farm plots. Given these competing uses for limited supplies of water, water-based projects run the risk of perpetuating inequality, with particularly negative impacts on women who are not represented in WUAs. For this reason, community-based groundwater governance cannot succeed without the active and equal participation of both men and women. Women’s participation is essential for promoting not only equity but also sustainability: women in both kebeles “place a high value on water and care about the use and sustainability of groundwater resources.” In other words, the sustainable and equitable use of groundwater depends upon women’s empowerment. Engaging women in community-based groundwater monitoring and governance recognises the knowledge that they already have. It involves what women in Farawocha and Dangeshta kebeles are doing anyway: they are in contact with groundwater regularly, and they are making consistent observations about the resources. Sometimes their observations are good indicators of groundwater quality and availability (for instance, changes in the colour and smell of water might suggest pollution or falling well levels). Nevertheless, training is critical for expanding upon and formalising their knowledge. Through guidance about what to observe, how to interpret results, and how to document and share information, women will be better equipped to monitor groundwater, and more confident in their abilities to do so. By thus leveraging the principles of citizen science, women can formalise their observations and actively develop and participate in monitoring groundwater. Only through the equal inclusion of women in community-based governance, does it become possible for groundwater to be used collectively, sustainably, and equitably. The IWMI study was also carried out as part of the CGIAR Research Program on Water, Land and Ecosystems (WLE), with support from the CGIAR Trust Fund donors. The results are reported in IWMI Working Paper 184, Gender Dimensions of Community-based Groundwater Governance in Ethiopia: Using Citizen Science as an Entry Point.